This weekend my girlfriends and I had our ninth annual christmas party (ninth!!!). Since last year my hostess duties were revoked due to the ice storm, I was extra excited to be hosting again this year. The colour theme was pink and gold, glitzy and girly was the main focus, and the night was filled with tons of laughter, and bottles of red wine. There is nothing better than spending time with people who have been by your side through literally everything- the awkward elementary days to the high school craze to even graduating university. The fabulous evening started with appetizers and eventually led into one activity which will kick off the glitzmas series (and I can't believe we've never done)- cookie decorating. During the week I made a batch of my aunt's sugar cookies, and the night before I whipped up some royal icing and put them in squeeze bottles for us to decorate. The cookies tasted delicious and looked amazing if you take into account all the vino and the jug of winter sangria we consumed prior to decorating, or pretend a two year old did them. Each girly had a paper place mat to ice on and a paper bag and twine to seal and take the cookies home. We decorated earlier on so they would have a chance to dry. Since no party table is complete without snacks I made some "moose crunch" and chocolate potato chips. I know what you're thinking... moose crunch (see recipe below), and chocolate potato chips?? Earlier in the week I used some leftover melting chocolate from another holiday cookie to dip some Wavy Lays, and what a brilliant idea it was. Best snack ever! Extremely addicting though. The moose crunch was equally as good, mixing peppermint, peanut butter and chocolate all into one crunchy bite. 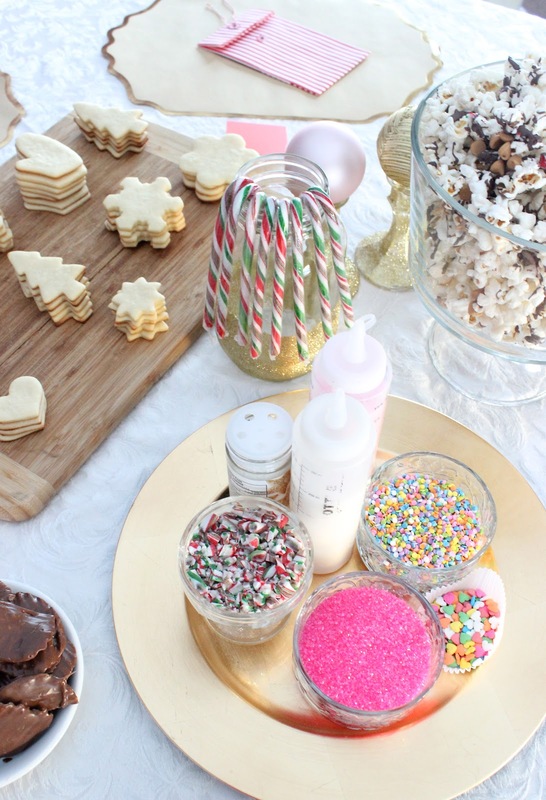 Take a peak into our cookie decorating fiesta. And better yet, get your girlfriends together for a night of festive fun! Stay tuned for much more from a P&P glitzmas!